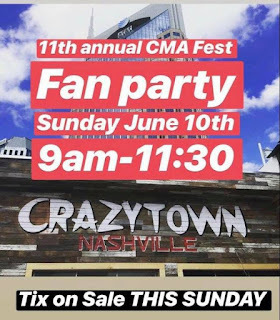 Chuck Wicks 11th Annual Fan Party Tickets On Sale Now! Chuck Wicks has announced that he will be holding his 11th Annual Fan Party at Crazytown (308 Broadway) on Sunday, June 10, 2018 from 9 AM - 11:30 AM! Includes meet and greet after acoustic set performance from Chuck. Breakfast pastries and bagels will be provided and full menu will be available for purchase through Crazytown.